← A Blessing of Rocky Mountain Bighorn Lambs! This year it happened that the week surrounding Memorial Day coincided with a New Moon. Consequently, most of the guesthouses at Casitas de Gila were occupied by amateur astronomers, along with their family members, from Arizona, Kentucky, Maryland, and Massachusetts. The astronomers were accompanied by a very impressive array of large telescopes for astrophotography and visual observing. As is typical for this time of year, the skies cooperated fully, with clear, dark skies prevailing throughout the week. 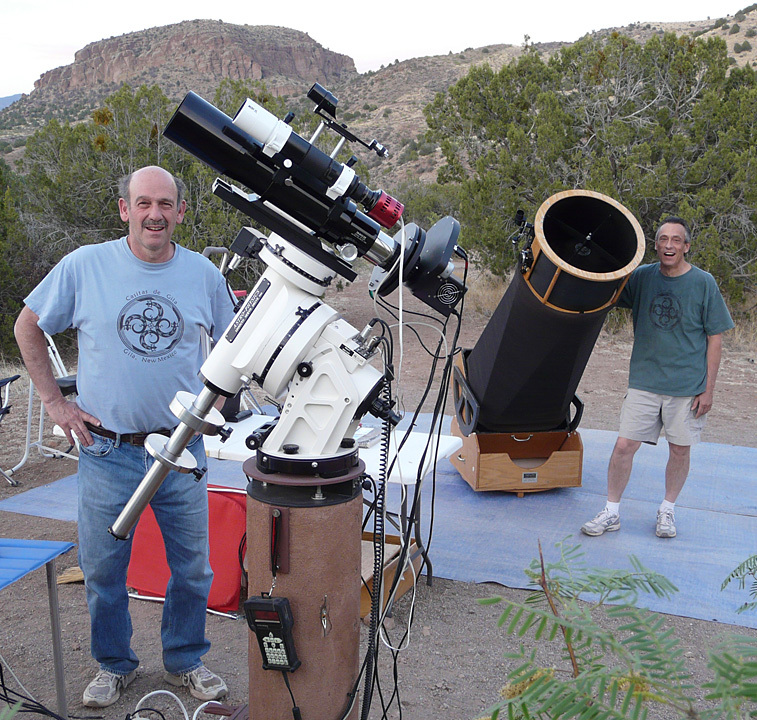 According to Chuck B. of Maryland and Paul C. of Massachusetts, two of our regular astro-guests who have been visiting Casitas de Gila three or four times a year for the past several years, the skies were judged to be “excellent” each night of their stay. Unihedron SQM-LU sky quality readings taken June 1, 2011, at Casitas de Gila Guesthouses by Lee B. While most astro-guests who stay at Casitas de Gila Guesthouses are highly impressed with the degree of darkness, seeing, and transparency that we typically experience here, one of the first-time astro-guests was able to objectively quantify the validity of Chuck’s and Paul’s subjective determination. Using a Unihedron SQM-LU sky quality meter, Lee B. of Arizona monitored an entire night’s sky darkness, obtaining values ranging from a high of 21.8 to a low of 21.46 as dawn approached, with an average of 21.68 for the time period from 10 PM until 4 AM on June 1, 2011. These values correspond to what is considered a natural starry sky with no light pollution, and are exceptionally high when compared to other scales used to measure sky darkness. Chuck was able to acquire vast amounts of digital astrophotographic data (enough to keep him very busy processing for the next two or three months) using an AP105 refractor telescope with a PDF Focuser, on a AP1200 mount, and M8300 camera. The first of the photographs he has processed is of Omega Centauri, a dazzling globular star cluster in the constellation of Centaurus, some 15,000 light years distant from us. 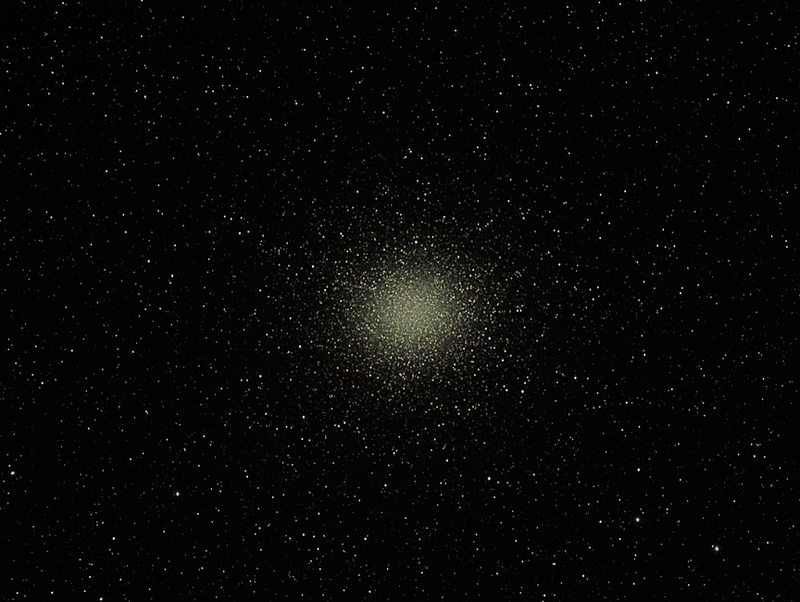 As our Milky Way Galaxy’s largest and brightest globular star cluster visible with the naked eye, Omega Centauri is a true giant, containing perhaps 10 million stars with a diameter of 150 light years. 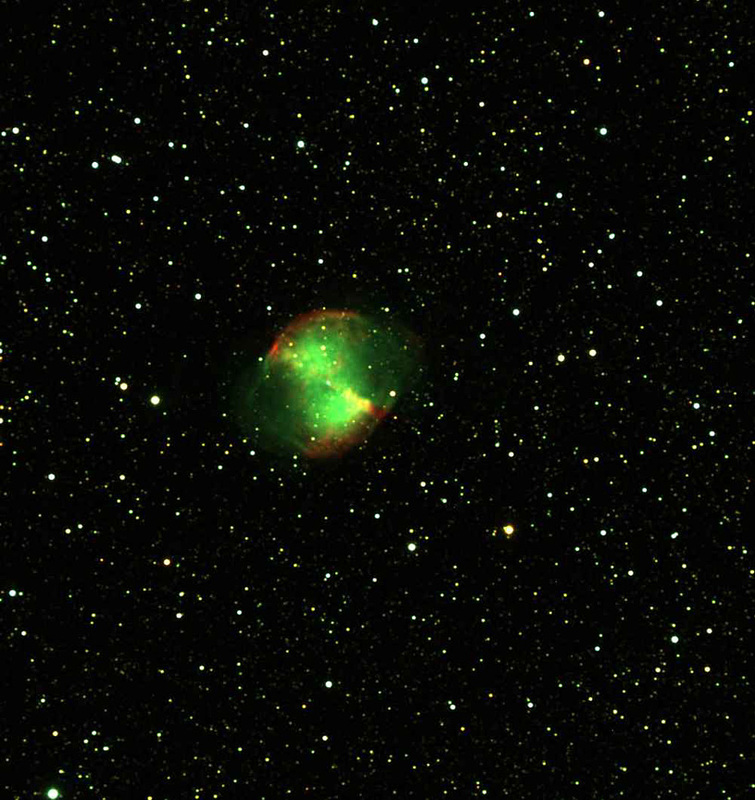 Another object which Chuck has processed is the Dumbbell Nebula (M27), a planetary nebula discovered by Charles Messier in 1764, about 1,300 light years away, in the constellation Vulpecula. Messier listed this object as M27 in his catalog of nebulous objects, which are now known as the Messier objects. Omega Centauri, taken by Chuck B.
Dumbell Nebula, taken by Chuck B. However, of all the objects observed and photographed during the week’s star party, none could compare in excitement with the “astrophotographic capture” that Chuck made of a new supernova, the rare event of an exploding star. 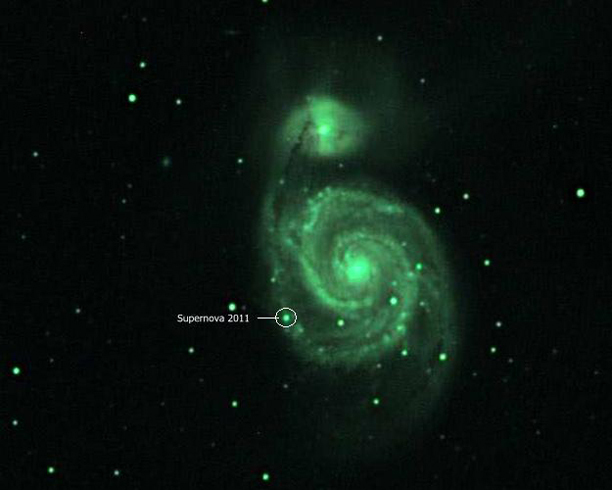 This new supernova was discovered on June 2, 2011, by French astronomers in the Whirlpool Galaxy (M51). Chuck was able to photograph it on June 5. Located within the constellation Canes Venatici, the Whirlpool Galaxy (M51) is one of the most famous galaxies in our sky. According to ongoing study by astronomers around the world, this new supernova must have taken place on May 31, 2011, as it is not shown in images taken prior to that date. 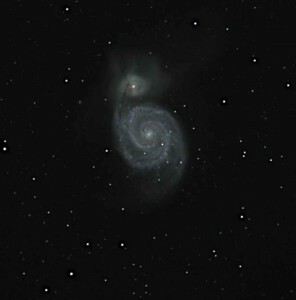 As fortuitous as it may seem, Chuck had photographed the Whirlpool Galaxy on May 30, and, indeed, the supernova was not there! M51 taken on May 30th before Supernova takes place. 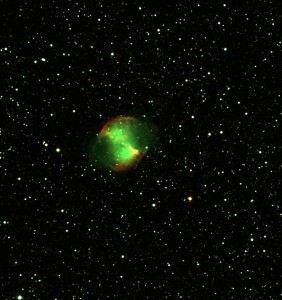 Photo by Chuck B.
M51 taken on June 5 after Supernova takes place. Photo by Chuck B. The fact that Chuck and other astronomers around the world were able to pin the exact day that the star exploded is quite mind-boggling, to say the least! Of course, when one says that the event took place on May 31, it must be remembered that in actuality this event took place many millions of years ago, when humans were still but a twinkle in our Creator’s eye. So to put this event into an Earth geologic-time perspective, the Whirlpool Galaxy is some 23 million light years away from us, so what we are looking at is an event that can be pinpointed as happening on a specific day about 5 million years after the Bursum Caldera Supervolcano eruption in the Gila Wilderness, some 28 million years ago! Paul, a long-time friend of astroimager Chuck and his partner in astronomical adventures, considers himself a member of the “old school observer astronomers clan”, those intrepid celestial explorers who, like the sea captains of old, prefer to hunt down their astronomical prey the old-fashioned way, relying solely on detailed, age-old star charts, masterful and precise visual celestial navigation, and dogged determination, instead of using any of those new-fangled, computerized, “go to” location devices. Using these tried-and-true methods, Paul was able to seek out, observe and explore numerous celestial specialties of the Spring and Early Summer firmament, such as the Whale and the Hockey Stick galaxies, the Wild Duck Cluster (M11), and the Omega or Swan Nebula (M17), using a 18” Starmaster Dobsonian reflector telescope. 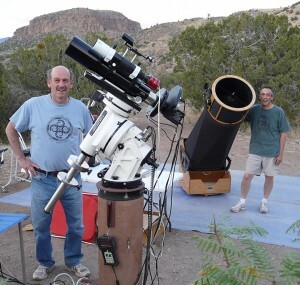 Back home in Massachusetts, Paul regularly gives public demonstration programs on astronomy, and so on several nights he graciously shared his extensive celestial knowledge with some of the other guests at Casitas de Gila Guesthouses, as well as with local area residents who have not had an opportunity to look through a large telescope. Trifid and Lagoon Nebulas taken by Lee B. One of our new astro-guests, Lee B., was also able to obtain large amounts of digital astrophotographic data during the two nights he spent at Casitas de Gila. He will be processing these over the coming weeks. Lee has been been involved in photography for quite some time, and has an extensive collection of his photos available for viewing and purchase on his website. One night while he was at the Casitas, having some “time to kill at the end of an imaging run”, as Lee put it, he was able to take an amazing photo showing both the Trifid Nebula and the Lagoon Nebula, some 7,600 and 4,100 light years away respectively, in the constellation Sagittarius. The resulting photo was a single, 30-minute, sub-frame exposure which shows incredible detail despite the low altitude of the object (28 degrees) when it was imaged. Lee was using an AP130GT scope on a AP900 mount and a STL-11000M camera. 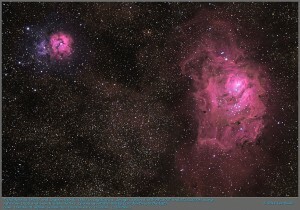 This photo can be seen on the astrophotography website cloudynights.com telescope review forum. Following his return home, Lee completed processing his data to produce the photo shown here. With the good weather and excellent viewing holding through the end of the week, eventually it was time for all of our astro-guests to return to Earth and head for their respective terrestrial abodes. All in all, it was another wonderful week for stargazing, astronomy, and astrophotography at Casitas de Gila Guesthouses. This entry was posted in astronomy, stargazing. Bookmark the permalink.